March 17th - 20th. Then returning and concluding my trip on March 25th, staying through the 28th. Jalama Beach is one of my most favorite places. It was the perfect location to begin and end my coastal trip. Traveling North from my house along the coast took me past Santa Barbara and approximately 30 miles later, brought me to Jalama Road. After turning onto Jalama Road, it's a 14 mile, sometimes one lane, 15 - 25 mph country road to Jalama Beach State Park. Cell phone service immediately disappears taking me off the grid. After pulling onto Jalama Road, there is a dirt turn off where I always stop on my way in and out to check email, voice mail and send my last messages before checking out. This spot just happens to be the home of a group of cows and their spring calves (who ran and hid when I drove up). 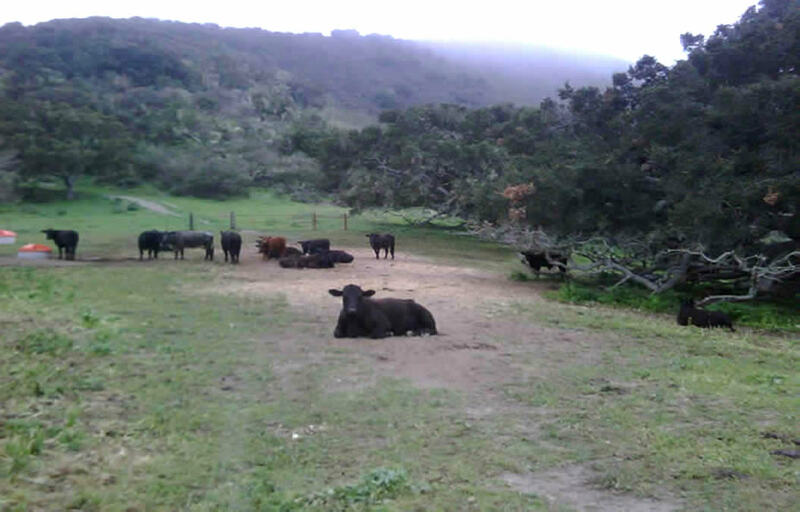 Jalama Road is a 45 minute journey through mountain roads, deep valleys, tree lined river beds and pastures. The spring rain has brought hillsides of wildflowers. The following photographs are all taken on the road to Jalama. 45 minutes of beautiful scenery and silence brings me around my last corner to the view above Jalama State Beach. I continue down the cliffs to the coast to make camp and enjoy the solitude of one of my favorite spots. You will notice that there is rarely no more than 2, if any, other people on the beach. The baby elephant seal below has entered into a state called catastrophic molting. This is when they come to shore and shed an entire layer of skin and hair in a several hour time period. Since they spend so much of their time in the frigid waters, they can't shed their skin continually like humans and instead lose it all in one concentrated time. The seals can grow up to 16 feet long, weighing up to 5,000 pounds. This pup was about 5 feet long and probably weighed around 150 pounds. The elephant seal was thought to be extinct at the end of the 1800's but due to the passing of the Marine Mammal Act of 1972, their total population is thought to be close to 200,000. I'll have more sighting posted once I get further North. The winds on the beach this day were very intense. Beachcombers stayed in the dunes. The temperature was in the 50's. Only the kite surfers could enjoy this type of beach weather! The view from my campsite included a sole monarch butterfly. the season typically ends in the beginning of March. This one must have waited for me. Jalama Beach is like no other. Most of the time I spend on the beach, whether walking, surfing or fishing is generally spent alone. Someone has been here before and made an awesome beach chair to enjoy the view!